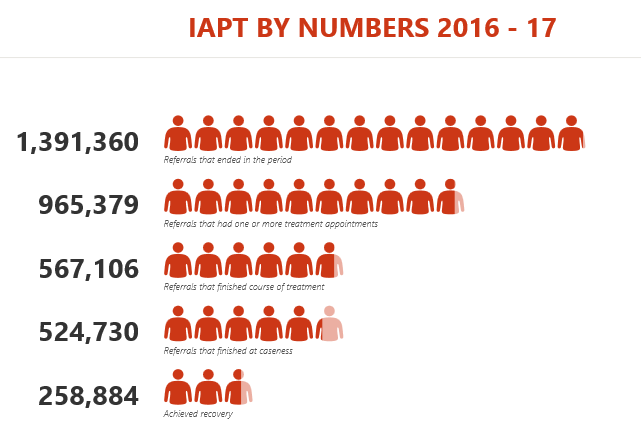 The latest IAPT annual report gives a headline figure of 49.3% of clients moving to recovery. In all, not great odds. Dig a little deeper, however, and it becomes clear that only one in four clients that enter therapy achieve recovery. Deeper still, we discover that the best performing areas have a recovery rate double that of the poorest. What needs to change? 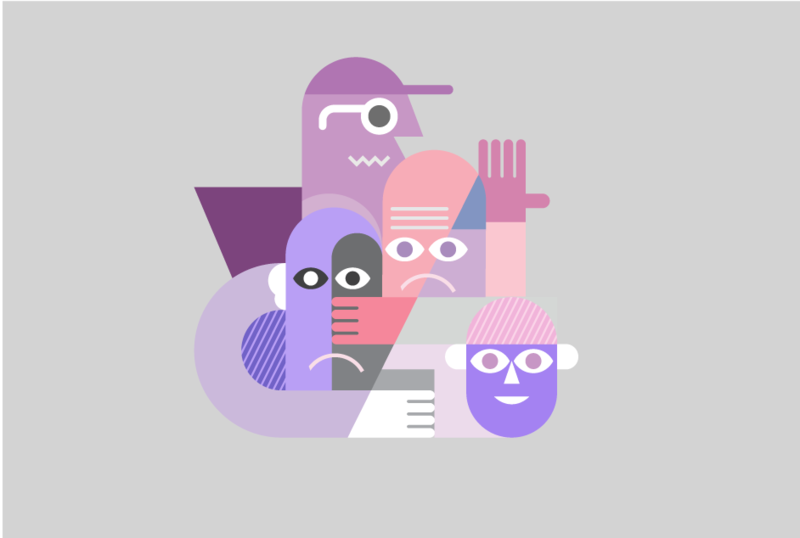 The graphic below shows clients at key stages of their journey through the Improving Access to Psychological Therapies (IAPT) programme in the year 2016 – 17. It’s an update of the figures that I provided for 2015 – 16 in a previous blog. Some of the performance data for 2016 – 17 show an improvement over the previous year, but they start from an already worryingly low baseline. The story behind the numbers appears to be one of extraordinary levels of attrition at each stage of the journey. I’ll unpack the key details for you in what follows. I end by highlighting the stark differences between best and worst performers and outline a simple process which can help enhance any service’s performance. This is an increase of three percentage points on the previous year, and edging towards the target of 50% (definitions for recovery and caseness are shown in the panel below). exceeding their respective targets of 75% and 95%. 40% of clients that enter therapy don’t complete. 49% of clients achieve recovery. 51% do not. At each stage I’ll show data for both 2015 – 16 and 2016 – 17. We start the journey with all referrals for the two years. The table below shows those referrals as 100%. Subsequent stages in the process, and the proportion of clients referred that still remain are also shown. In 2016 – 17, 69% of those referred entered therapy. This is defined as having one or more sessions of therapy. In both years the proportions were more or less the same. As we progress through their journey we can see an emerging story of attrition. By the end of therapy, only 41% of clients that were referred now remain. Those that reach recovery represent just 19% of the total referred. That’s less than one in five clients. I don’t know why only seven in ten referrals entered the therapy process. I can only speculate, but in doing this it’s important to note that nearly nine in ten referrals were seen within six weeks. Hence length of wait may not be the most important factor. Otherwise, they may no longer have needed therapy, their referral may not have been appropriate, or they may simply not have liked what was offered to them. It’s worth saying here that it’s got much more difficult to extract meaningful data from the annual IAPT reporting. The summary report has been reduced from 67 pages in 2016 – 17, to just 12 for the past year. Of those 12 pages, I found only two that carried any data that shines a light on client journeys. POSTSCRIPT: According to a personal communication from NHS Digital received after publication of this blog, the report on which this blog is based is an interim report. A fuller report is expected sometime in February 2018. We begin this stage with all clients that entered therapy. That is, all those that had one or more therapy sessions. In 2016 – 17, 59% of those entering therapy are recorded as ending it. This figure is up 3% from 2015 – 16, but the fact that four in ten clients do not complete should be a concern. Following the journey through, we can see that just 27% of those entering therapy achieved recovery. In other words, clients entering therapy appear to stand just over a one in four chance of recovering. Again, it’s hard to know from the data why four in ten clients do not end therapy. In my experience, however, clients more commonly drop out because they feel that therapy isn’t working for them for some reason. Often, they simply disappear without the opportunity to explore this with their therapist, and make adjustments that may better serve their needs. Here we start with all the clients that are recorded as finishing a course of treatment. The first point to note is that not all clients were at a case level of symptoms or distress at the outset. Not matter how much improvement they make, therefore, they cannot achieve recovery. In the 2016 – 17 population, 93% of clients were at case level, and could potentially recover. This is higher than in the previous year. In other words, a greater proportion of clients had the potential to recover. Those reaching recovery represent 46% of all those that finished treatment. For 2016 – 17, this is an increase of 4% over the previous year. This may be explained, at least in part, by the fact that the proportion of clients who were at caseness was also higher than in 2015 – 16. The final leg of the journey, starting with clients who finished treatment, that were at case level at the point they started. In this population we have all the clients who have the potential to achieve recovery. In 2016 – 17, 49% of clients achieved recovery, of those that finished therapy and were at case level at the start. To be precise, the figure given in the IAPT report is 49.3%. The figure for those achieving recovery for 2016 – 17 is 3% higher than in the previous year. As explained in the last section, this may, in part, be explained by the fact that a higher proportion were above case level when they entered therapy. While the increase in recovery rates for 2016 – 17 over the previous year is clearly welcome, it remains the case that more clients did not recover than did. At nearly 50:50, the odds of recovering or not recovering are almost even. If we dig a little deeper into the dataset that accompanies the IAPT annual report, it becomes apparent that behind the headline figure of 49.3% recovery lies a significant range of performance. The best performing service achieved a recovery rate of 66%. The worst performance recorded was 33%. Simply by being in the right catchment area, clients of the best performing service stand twice the chance of recovering. 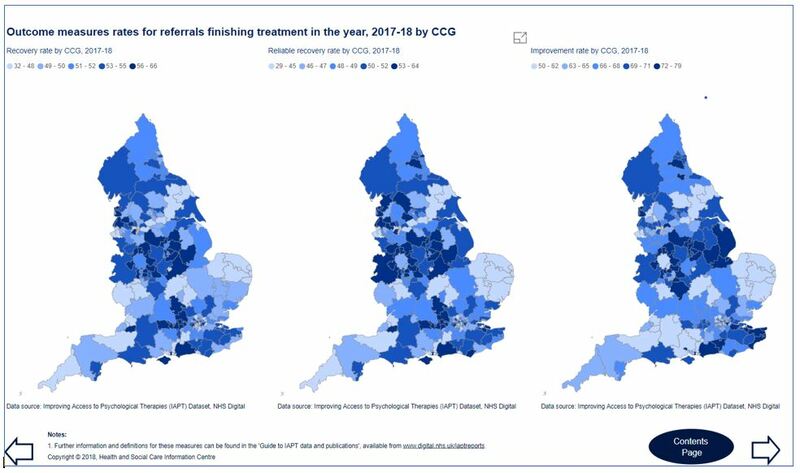 If you want to know which star shone brightest, or find out about performance in your area, you can find the recovery rates and other KPI’s for individual Clinical Commissioning Group (CCG) areas very simply. 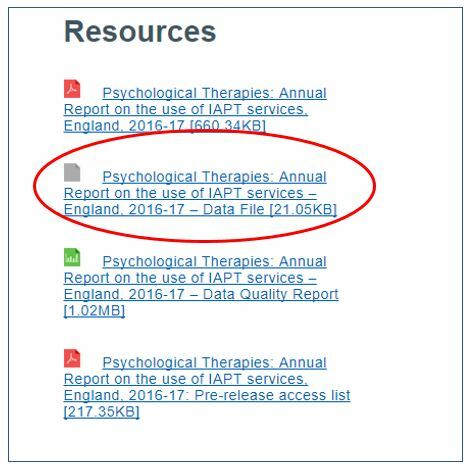 Just visit the NHS Digital IAPT page here, and download the data file. The file is a single spreadsheet. Column B lists the individual CCG areas. Up to column O, all the values are in number form. Beyond column O, they are percentages. Those columns include improvement and recovery rates, as well as waiting time data. This is simpler than you might imagine, at a least in theory. I have a simple five-point prescription. Find your baseline relative to other services and the average for all services. From here you’ll have a sense of how far you could develop. Learn from what high performers are doing that seems to work. This may be other services, or therapists within your own service. Work out what you might do differently. Make a plan. Keep it simple. Implement your plan. After an appropriate period, look at the results. How have your performed relative to before? What worked and what didn’t? Keep on striving to be better than you were before. I know from experience we can always be better, and I’ve told the story of my own service’s journey in another blog. In part it’s about mindset, but it is also about knowing where we can make a difference. Which leads me nicely to an initiative developed within IAPT that offers real promise for the future. It’s a collaboration across eight NHS Trusts sites where therapists are being trained to use outcome feedback in their practice. The project is led by Jaime Delgadillo at the University of Sheffield, supported by the PCMIS team (developers of a web-based case management system) at York University. This is an example of the type of initiative that can, over time, help to make a real difference. IAPT is far from perfect, but it’s what we have for now. Like an oil tanker, it’s going to take time to turn it around, but if the right things are done in the right way, then it is far from impossible. Please leave a comment below and please let us have your thoughts. Next articlemeasures and systemsHow do clients experience routine outcome monitoring? Barry McInnes on Even ‘super-shrink’ has a weak spot. And you? David Solomon on Even ‘super-shrink’ has a weak spot. And you?